Want to avoid the midsummer heat of the Mediterranean? Scandinavia is the place to go. You'll find vibrant cities, stunning landscapes, and you'll get to spend some time cruising the seas if you follow our suggested itinerary. 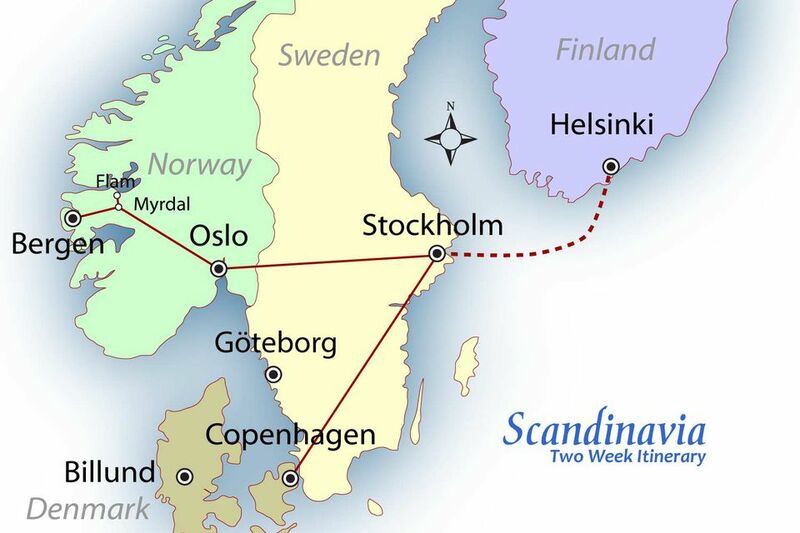 Our Scandinavia map shows the itinerary route, which offers a peek at Scandinavian capitals, as well as a ride on one of Europe's most scenic railroads, the Flam line. Chances are, it'll be easier to get to Copenhagen for most folks, so our itinerary will start from here. You can do it in any order you want, of course. Copenhagen is an amazing place to visit. It's a great walking town, and it has a theme park called Tivoli that doesn't have people running around trying to look like giant rodents, so adults can enjoy it, too. You'll want to spend at least three days in Copenhagen. In fact, you'll want to spend at least three days in each capital, along with on overnight in Flam, if you decide to take that detour. The next stop on our itinerary is Stockholm, Sweden's capital. Stockholm is 324 miles or 521 kilometers from Copenhagen. By train, the journey takes 5 to 7 hours. Stockholm is an extraordinary city built on 14 islands. If you like to be beside water, Stockholm's your place; around the Swedish capital, 24,000 islands are waiting to be explored. Beautiful Oslo sprawls on both sides of the Oslofjord, and is known for handing out the Nobel Peace Prize in City Hall. You'll want to head out to Bygdø to the west of Oslo, to visit the many Norwegian museums: the Kon-Tiki Museum, the Norwegian Museum of Cultural History, the Viking Ship Museum, and the Norwegian Maritime Museum. The distance between Oslo and Stockholm is 259 miles or 417 kilometers. Trains take about six hours to make the trip. Get ready for one of the most scenic part of your trek across Scandinavia. Bergen is a wonderfully scenic coastal town in Norway, and if you detour to Flam via the Myrdal to Flam railway, you'll get some even more spectacular scenery. Going straight from Oslo to Bergen without the detour takes 6.5 to 7 hours by train. There are 4 trains a day. But you really don't want to miss the Flam extension. The trains that take you way down to Flam station tucked into the Aurlandfjord, are special in themselves. The steepness requires 5 different braking systems; the altitude goes from 866 meters at Myrdal to 2 meters at Flam. The Aurlandfjord is a finger off Norway's longest fjord, the East-West trending Sognefjord. Bergen is the second largest city in Norway after Oslo, but it has a small-town feel about it and everything is in walking distance. Bergen is a World Heritage City as well as having been a European City of Culture in 2000. You can order train tickets for the whole Oslo-Myrdal-Flam-Bergen run, or you can do Flam as a round trip from Bergen with the Sognefjord In a Nutshell Tour from raileurope. If you have time, take the ferry to Helsinki, Finland. The ship takes 14 hours to reach the city. Time it right and you can save hotel cost by sleeping on the ferry. Helsinki is a modern city which attracts many cruise ships and ever more tourists. 2006 was a record year for tourism in Helsinki. Since Helsinki was settled late, it doesn't have a medieval core, but its skyline is dominated by church spires and it has a beautiful harbor, a favorite of cruisers. Helsinki Weather and Historic Climate for travel planning. You can take flights between the Scandinavian capitals as well. Scandinavia is expensive. You can usually save considerable money with a rail pass, if you decide to travel by train. Rail Europe (buy direct or get information) supplies a variety of Scandinavia rail passes, accessible from the link above. The Scanrail Pass of 5 or 8-day duration is about right for this itinerary. Check out the bonuses; you can take advantage of savings on some ferries and you'll get a discount on private rail lines like the Flam line referenced above. For the intrepid travel planner who likes a different kind of beauty that hardly anyone visits, a trip to Greenland might be just the thing.